One of the best things about Italy is the great melting pot of different ancient and modern cultures in such a relatively small peninsula. For instance, even though I cannot wait to visit Greece someday, I already have Greek ruins just a train ride away at Paestum. I’ll be honest: I was not at all thrilled to go to Paestum. As I mentioned in my last post about Pompeii, ancient ruins are not really my thing. 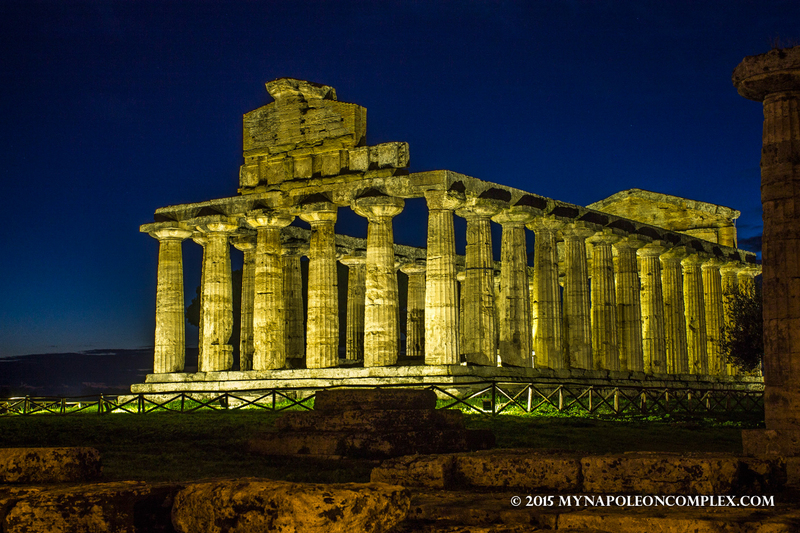 In fact, if it wasn’t for the goal we set for ourselves to visit UNESCO sites, we might not have ever gone to Paestum, and that would have been a shame since it became my favorite out of all the ancient ruins we have seen in Italy. 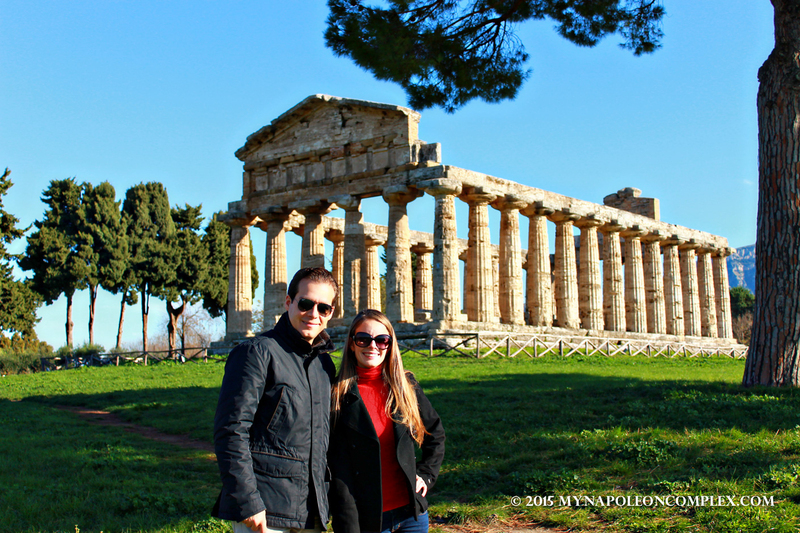 Paestum was founded by the Greeks in about 600 BC (according to archaelogical evidence) under the name of Poseidonia. It was later conquered by the Lucanians at the end of the fifth century BC and finally by the Romans in 273 BC, who gave it the name by which it is still known today, Paestum. Its main features are the three temples, temple of Athena, Neptune and Hera, which are among the most well-preserved ancient monuments. Temples of Hera (far left) and Neptune at twilight. Temple of Athena at twilight. The temple of Hera is the oldest of the three, having been built at around 550 BC. The temple of Neptune, which is beside the temple of Hera, has been thought to be a second temple of Hera, Zeus and/or Poseidon (Neptune for the Romans). Farther away from those two is the temple of Athena. Apart from the three main temples, Paestum has many of the same characteristics of other ancient cities, such as a forum, an amphitheater, and thermal baths. When we went, we basically had the entire area to ourselves, whether it was because of the time of year or because the number of tourists to Paestum is small, I don’t know. 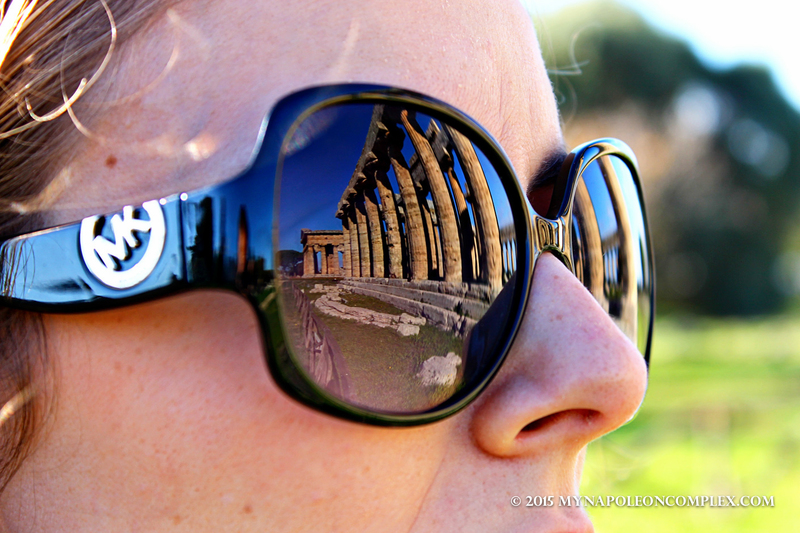 Because I’m such a visual person, the best thing about Paestum is that it is so photogenic. Rather than Pompeii, where I felt that half the time I was just taking pictures of rocks, in Paestum you have the opportunity to see real, almost perfect ancient monuments. For the admission price, you can also visit the museum located in front of the ancient site, which houses many of the terra-cotta pots and artifacts found at the site. If nothing else, it is worth seeing the ancient painted tombs, most of them from the Lucanian period except one. The Tomb of the Diver, from the Greek period, is the only tomb of the time to survive in its entirety and the only one to be painted with frescos of human subjects. Jaime’s artistic picture of my sunglasses. Temple of Neptune in the daylight. We were so lucky it was such a beautiful day. If ancient cities are not enough to drag you to Paestum, I’ll give you another reason: mozzarella di buffala. Mozzarella di buffala is a cheese, much like Parmaggiano-Reggiano, that is best served in Italy, in its DOP location. In the states, for one, it is not easy to find real mozzarella and it is even harder to find Italian mozzarella. Even when you do buy mozzarella in the States, it is a big jump from the mozzarella di bufala you find in Italy. This mozzarella is made with Italian Mediterranean water buffalo, the only indigenous Italian breed of buffalo. Furthermore, in order for mozzarella di bufala to earn DOP statues, it must be produced between the areas of Rome to Paestum. However, according to many Italian sources, the best mozzarella di buffala Campana (from the Campana region) is found either in Caserta or in the Salerno area (including Paestum). According to Wikipedia, Italy produces 33,000 tonnes of mozzarella di bufala each year, with only 16 percent of it sold abroad and mostly within the EU. 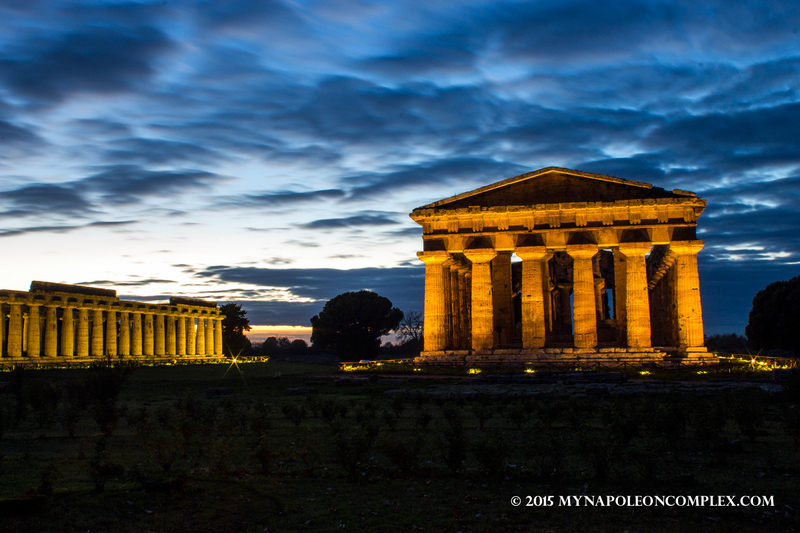 Once you get off the highway, there’s really one road that leads you through a few small towns directly to Paestum. When we were on it, we couldn’t help but notice the absurd amount of caseifici, or cheese factories, we passed by. It was enough awaken the curiosity in a mozzarella di bufala lover like Jaime. That night, he did some online research and found this awesome article in an Italian website called Scatti di Gusto, detailing a taste test of the most famous caseifici in Paestum and a list of the ten best. The article is in Italian, but if nothing else, it is worth noting the names of those places. Italian water buffalo in Barlotti, a dairy farm. The next day we went directly to number one, Tenuta Vannulo. This, my friends, is the reason Italy is a foodie paradise. Tenuta Vannulo is a farm comprised of a caseificio, where you can buy the mozzarella fresh from the buffaloes that are 300 ft away, a yogurteria, where you can buy yogurt and ice cream made with buffalo milk, and a leather factory, with purses and other leather products. We bought mozzarella to go and we also ate some right out of the bag, then we had some dessert at the yogurt place. The yogurt literally changed my life. I am not a yogurt fan at all, yet I became a believer when I tried the natural buffalo milk yogurt, with no flavors except the honey they poured over it. It was amazing. So amazing, that I didn’t take any pictures of it while I was there just because I was so busy inhaling it. My biggest regret is not buying some to take home with us because we have yet to find any buffalo milk yogurt in Rome. After we left Tenuta Vannulo, we were by no means finished with our mozzarella tour, so we headed to another farm on the list, Barlotti. Here we had a full lunch, with more mozzarella and yogurt for dessert. I will say that out of the two, I enjoyed both the mozzarella and the yogurt of Vannulo more, but Barlotti had an actual restaurant where we can sit and enjoy the mozzarella onsite. Even better, the buffalo were literally less than 100ft away from the restaurant. You cannot get more farm to table than that! Since then, I’ve found that each year Paestum hosts an entire festival highlighting the mozzarella made on the Strade della Mozzarella (Mozzarella street, or how I call it, Mozzarella mile). This years its in April, but we won’t be able to attend because of another trip. 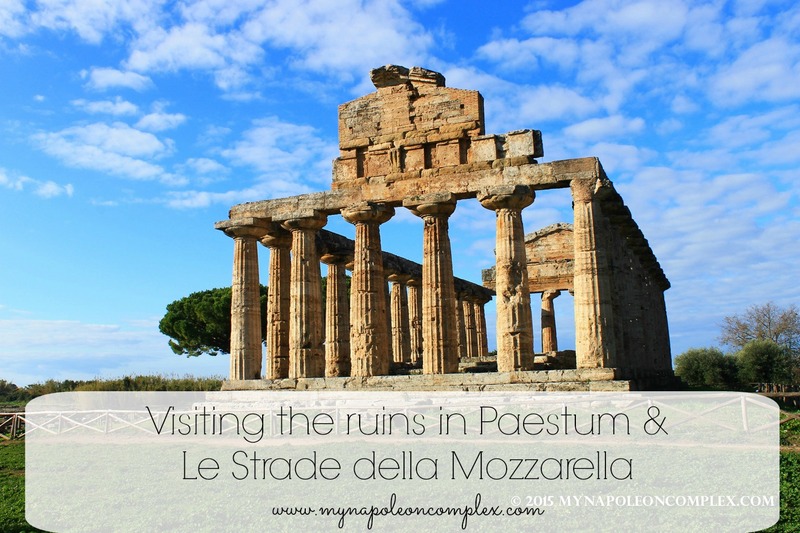 However, we will without a doubt return as soon as possible to Paestum, this time to go on a foodie tour through Vannulo and other mozzarella di bufala farms. Note: I received no compensation in any form from either Tenuta Vannulo or Barlotti. I write about them only because we enjoyed them so much! The Tale of Finding an Apartment in Rome! The long and winding road to finding the perfect apartment in Rome.